This post was originally published on the Huffington Post UK website on July 21, 2015 in response to the negative reactions to the UK government’s decision to grant B&K Universal permission to expand their beagle breeding facility. It is republished here with permission both from the Huffington Post and the author, Tom Holder, director of Speaking of Research. It’s not a question most of us bother with when we take advantage of the huge array of medical treatments available to us. All modern medicine is built on the ‘basic research’ which allows us to understand our physiology, and the diseases we suffer. Much of this research has been done, and continues to be done, in animals. Had Mering and Minkowski not shown the causal link between the pancreas and diabetes in dogs, we might never have discovered insulin (much more work was conducted in dogs by Banting and Best who later won the Nobel Prize for the discovery of insulin). Had Pasteur not shown how dogs could be vaccinated using weakened samples of the virus (made from rabbits), we would not have both the veterinary and human rabies vaccines. Animals are also used to develop and refine medical techniques. Dogs played a key role in perfecting artery to vein blood transfusions, as well as showing that citrated blood could be safely transplanted (thus preventing the blood from clotting). More recently, 23 pet dogs with paralysing spinal injuries were able to regain some use of their rear legs thanks to a novel stem cell transplant treatment. This research had originally been done in rats, and last year was used to successfully treat a paralysed man in what could prove to be one of the biggest medical advances of the decade. By law, animals must also be used to test the toxicity and safety of new drug compounds before they can be given to human volunteers. A pharmaceutical company will have used the findings of basic research studies to identify types of drugs which might be effective against certain diseases. They will then use a variety of non-animal tests – computer modelling, cell cultures and more – to identify the most promising drug candidates. Those compounds will then be tested in animals. If they are deemed safe enough, they may then be moved forward to human trials. It is testament to the effectiveness of animal safety tests that nobody has died in Phase I clinical trials in the UK for over 30 years (with only one badly conducted clinical trial causing severe harm in recent times). Given public misconceptions on the issue, it is worth being clear and saying that in the UK, and across the rest of the EU, it is illegal to use animals to test cosmetic products or their ingredients. The UK ban came into force in 1998, one year after a ban on tobacco research using animals. The Government has also announced a ban on using animals for testing household products. 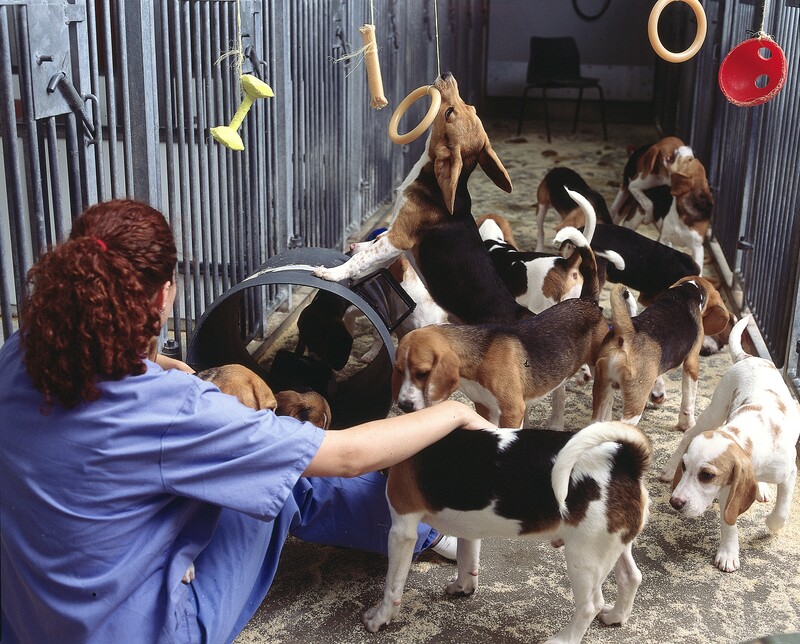 Despite the examples used in this article, dogs are not used that much in research in the UK. They account for less than 0.1% of all animals used in the UK each year. This compares to the 98% of procedures which are conducted on mice, rats, fish or birds. In 2013 there were 3,554 dogs used in 4,779 procedures (down 30% from a decade ago). Due to special protections that exist for dogs, cats, primates and horses, researchers must justify to the Home Office why another species, such as a mouse, fish or sheep, cannot be used instead of a dog. The research must be approved by an ethical review board, who will work to ensure the implementation of the 3Rs (Replacement, Refinement and Reduction of animals in research). The researcher, the institution and the individual procedure must each be licensed by the Home Office. The video below, produced by Understanding Animal Research, shows dogs in a typical pharmaceutical laboratory in the UK. So why a breeding facility? Currently, around 20% of the dogs used in research in the UK are imported from abroad (those involved in 956 of the 4,779 procedures in 2013). This is because the UK breeding facilities cannot provide all the dogs used in the UK. These dogs have to endure long and potentially stressful flights from other countries. Surely it is better to breed them here in the UK, where we have some of the highest standards of laboratory animal welfare in the world and where our facilities can be easily monitored by the Animals in Science Regulation Unit inspectors? The new breeding facility offers animal welfare standards above and beyond those demanded by the Government. Dogs will be kept in socially housed groups in multi-level pens which can be joined together to create larger runs for the animals. All the animals will have toys and enrichment in their enclosures, and will interact with trained laboratory technicians every day. It is this sort of investment in animal welfare we, as an animal-loving nation, should embrace. Petitioning the Government to reverse their decision on approving the beagle facility in Hull is misguided. It will not reverse our need to use animals in research, or even change the number of dogs used in the UK. What it will do is force another generation of puppies to take long flights from other countries, having been bred in older breeding facilities away from the UK inspectorate. Animal research may not be something we want to think about when we take our medicines – but it is something necessary for those medicines to exist. Instead of trying to ban animal research, let’s instead make sure that if we do it, we do it to world-class standards. This entry was posted in Guest Posts, News on August 12, 2015 by admin.